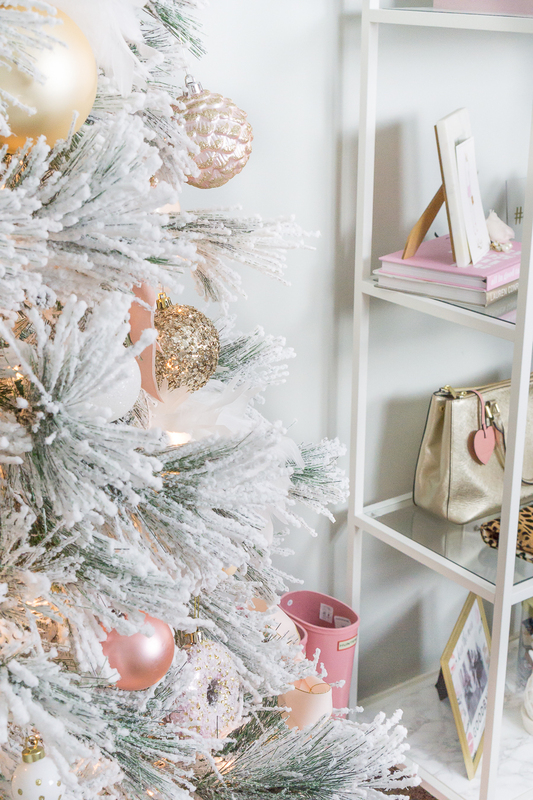 This year I decided to decorate my office space with a feminine blush and gold Christmas tree, and it makes me so happy! I have to keep the downstairs tree gender neutral, so I wanted to go all out with this one and make it a feminine Christmas tree. 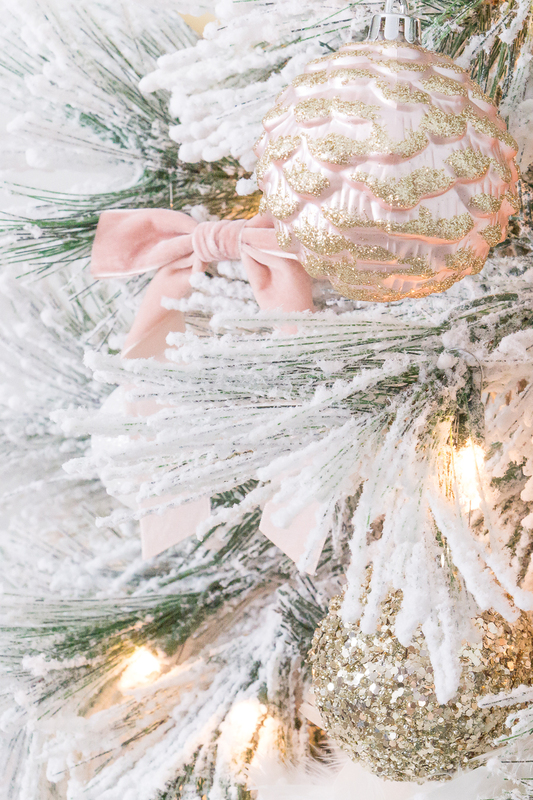 This 7 foot flocked Christmas tree is so affordable ($179) and makes a gorgeous statement. 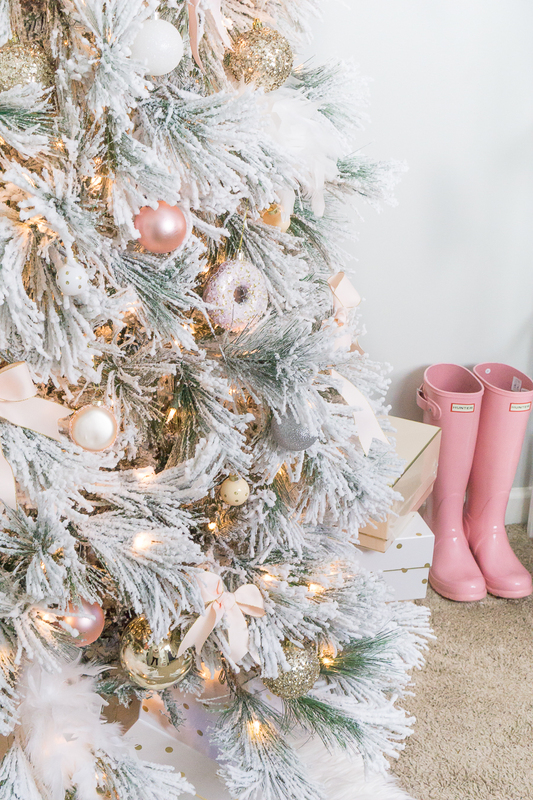 The flocking on this tree didn’t shed as badly as our other tree from Hobby Lobby. When getting the tree out and fluffing it up (which I didn’t spend too much time on…) the flocking came off in bigger chunks. Our flocked tree from Hobby Lobby came off in a fine dust. The clean up was much easier and minimal! I wanted to keep it affordable, so I used a fur rug I already own from Home Goods and used Sugar Paper ribbon I already had in my gift drawer for the bows. I also added a hair bow I already owned… try to get creative and use what you already have! 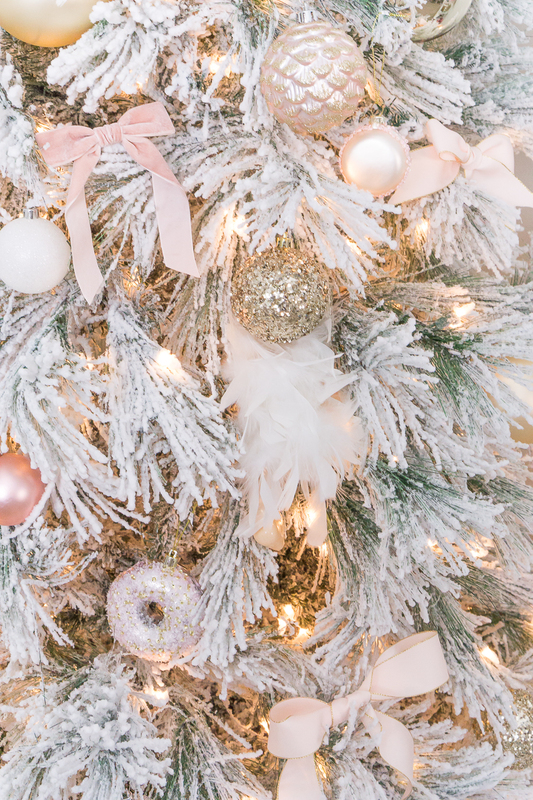 I bought the pastel balls, donut, and macaroon ornaments from At Home and the rest from Hobby Lobby (all 50% off), along with my Gold tree topper. I buy a few of these gift boxes every year and use them as storage for small accessories and random items throughout the year. They are only available this time of year and always sell out! 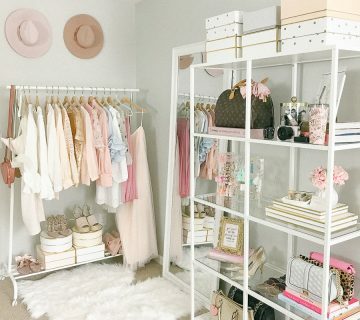 You can see them here and here styled on my clothing rack. 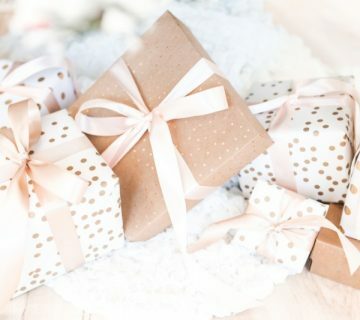 For the blush bows, I used gift wrap ribbon I already owned and made small little bows. I originally thought I wanted big drapey bows, but decided I liked the smaller bows better in the end. The rose velvet bow is actually this hair tie I already had! I used both big, medium, and very small ornaments to fill out the tree. Again to keep it budget friendly, I just decorated the front of the tree. 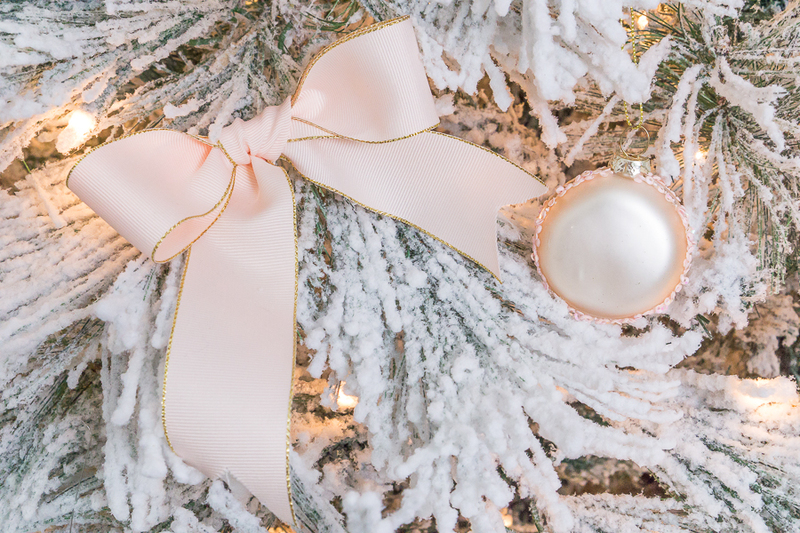 The little ornaments are actually used for gift wrapping, but I thought they added a little texture to the tree. I also have two packs of them from last year to go on my mini white tree downstairs on the Christmas bar cart. You can see our main Christmas decor from last year here. My Aunts decorated a clients home for the holidays and I was lucky to get their left over decorations! I’m focused on paying off my student loans, so I like to keep seasonal decor budget friendly for now. 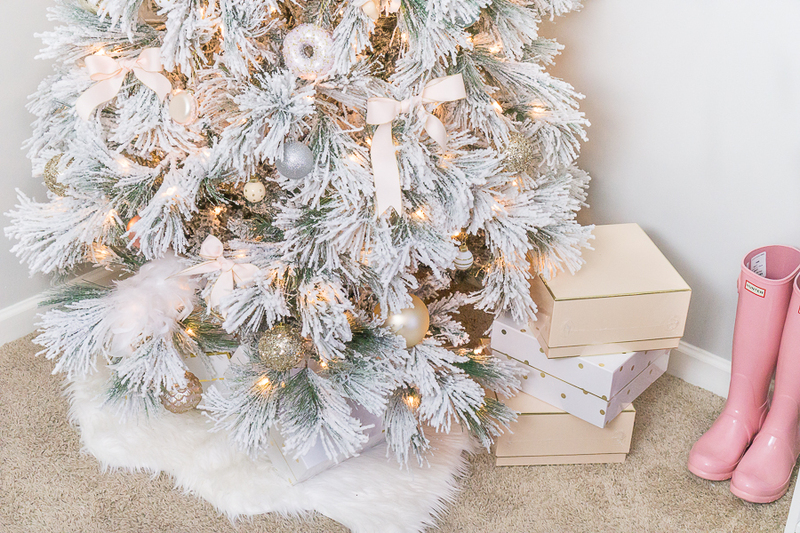 That’s why I couldn’t pass up on this gorgeous affordable Chritmas tree! 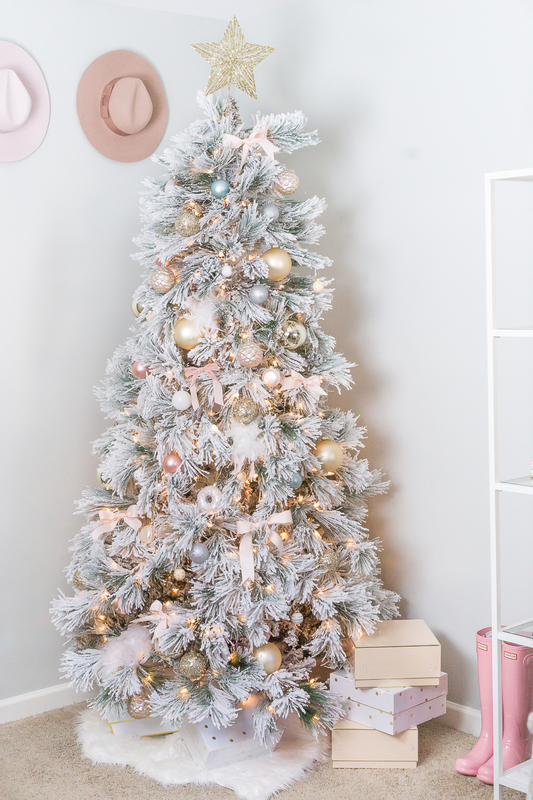 I still need to unwrap the new boxes and dress up under the tree with “presents” but I wanted to get this up so you had time to plan out your Christmas tree decor! Strawberry Chic is apart of several affiliate networks where commissions may be earned through purchases and/or clicks. Read my full affiliate disclosure here.